We have spoken of the economic inefficiency of the service-oriented business model of the US telephone and cable companies. They see themselves as selling video, telephone, and Internet service -- the so-called "triple play." We see the social cost of this business model when we compare the US with other nations, where access network operators open their networks to competing service providers. We pay a lot for inferior broadband connectivity. It is not surprising that the telephone and cable companies are trying to increase their profit at public expense, but there is ironic evidence that this service-oriented business model may also be hurting them. In a nutshell, the argument is that the owner of an access network can make more money by opening it up to all service providers. True, they would forsake the monopoly profits of being the sole supplier of telephony, movies or television on their network, but they would make it up in wholesale and retail sales volume as many companies compete to sell these and other services. If this is the case, open networks are a win-win proposition. Both the public and the cable and telephone companies win. Yankee Group analyst Benoit Felten will present a one-hour webinar on this topic on June 30. The presentation will be archived, so you can listen later if you miss it. For further discussion of this "dumb pipe paradox" see Brough Turner's blog. Proprietary market research firms like The Yankee Group, Infonetics, and Forrester Research study various industries and technologies. They typically make money by holding specialized conferences and selling reports and consulting services to companies that are in or depend upon those industries and technologies. For example, a report on the future of WiFi would be of interest to both WiFi chip manufacturers and to computer companies that will be using those chips in their products. Market research firms hire highly qualified analysts and sell the results of their research to many interested companies, enabling them to share the cost of the research. That is good news -- it makes business more efficient. The bad news is that the research reports are too expensive to be used in education. But, since the market research firms want publicity, they provide some very useful information for free. They publish press releases and executive summaries of their reports as well as blogs and webinars. Take The Yankee Group for example. They bill themselves as "The Global Connectivity Experts," making their research relevant to our class. Twenty six Yankee Group analysts write blogs with posts in 30 categories. You can read press releases on and summaries of their research here. Yankee Group analysts also present webinars on their research. One can register to watch these online presentations as they occur or download them afterward. Which of the Yankee Group bloggers or topic categories is most relevant to our class? Which of the previous webinars seems most relevant? In a recent post, we spoke of the ISP's service-oriented business model, contrasting it with the unfettered delivery of information (bits) on the Internet. As an example, we cited the NBA playoff games being streamed over the Internet as well as broadcast on television. We noted that the service-oriented business model maximized carrier profit at the expense of consumers and the national economy. This and other services like providing expert commentary, statistics, alternative play-by-play reporting, supplementary video, etc. would add to the viewer experience and create an online community of fans. 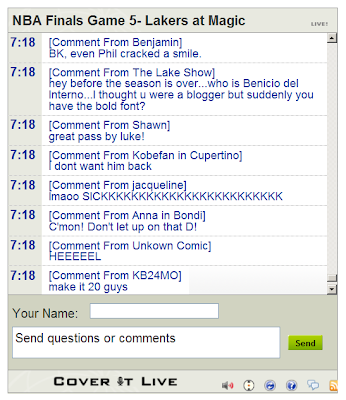 Would you enjoy chatting with other fans while watching a sporting event? 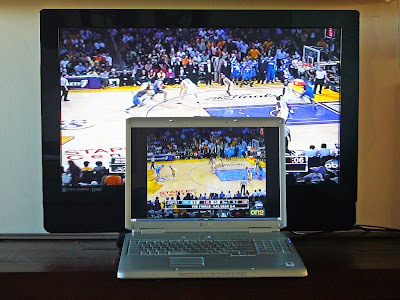 Would you rather watch a sporting event on broadcast television or your computer screen? Which would you prefer if the Internet speed increased to the point where it could match the size and resolution of your television set? How will WolframAlpha change math instruction? When portable calculators were invented, we debated whether students should be allowed to use them in school and on tests. WolframAlpha takes this question beyond grade school. Enter y = 10 x, and you are told that it is the equation for a straight line with x and y intercepts at 0 and a slope of 10, and the equation is plotted. Enter x^2, and you are told it is a parabola, which it plots and gives the global minimum, derivative and indefinite integral. Enter x^2 + y^2 + z^2= 10, and you get a plot of a sphere along with its center, radius, diameter, volume and surface area and other information including derivatives. Enter sin(x)^2 + cos(x)^2, and you get a plot of a constant 1 along with series representations and integrals. Enter derivative x^3, and you get the derivative and its plot plus an indefinite integral and global maximum. Enter integral x^2 + 3x dx, and you get the indefinite integral along with its plot. If you click on "show steps," you see the steps leading to the solution. Enter definite integral x^2 (0,1), and you get the definite integral from 0 to 1 along with a plot. You get the idea -- try a few for yourself, and you will be amazed at the power of this symbolic math program. Should students of algebra, geometry, trigonometry, finance, statistics, calculus, etc. be allowed to use WolframAlpha in class, for homework, during exams? P. S. For links to further discussion, see this post. The incumbent Internet service providers have a service-based business model, differentiating between Internet, telephone, text-message, basic television, premium television, voicemail and other services. This enables them to vary prices to maximize their profit and discourage competition. For example, they charge exorbitant fees for text messages and discourage Internet video by charging extreme prices when download caps are exceeded. This differentiation between types of data or service is arbitrary. It is all bits. As we see, the television coverage, including the ads, is being delivered over the Internet with a four second delay. The Internet image quality is below that of the television signal, but that will improve when US Internet speeds catch up with the rest of the world. The incumbent telephone and cable companies profit from their service-oriented business model, so they will resist becoming information utilities, delivering undifferentiated bits. Can they sustain that position in the long run? Would we tolerate a water company that differentiated between drinking and washing water or a gas company that differentiated between heating and cooking gas?